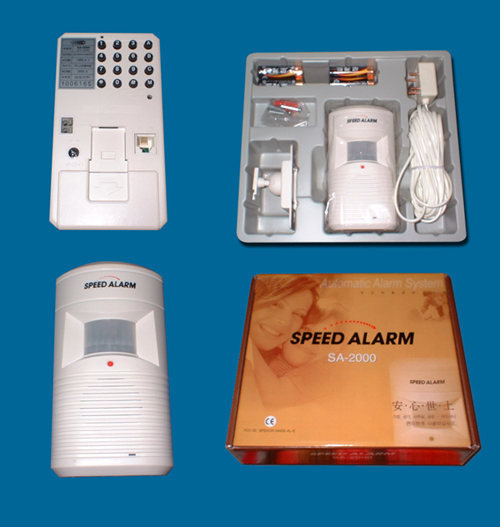 This alarm system, SA-2000, detects any movement and sends automatically alert message/sound to the programmed numbers. It consists of semiconductor circuit which reduces the size of the unit. The sensor, with powerful detecting function, perceives movement and informs you instantly through programmed numbers of telephone, mobile phone or pager. Economical Low power usage and no additional maintenance cost. Reliable Responds quickly and accurately to the programmed numbers with PIR and magnetic sensors which detect any moving objects. Simple Easy to install and use. Moreover, it is easy to re-locate. Dial up to two different phones or pagers within seconds ; you can be easily reached anytime. The above accessories are supplied together with the main unit SA2000 unless those mark optional, thus system is very easy to install and set-up any where you need to be secured . All connections and installation is fully Do-it yourself. 1. During operation, SA-2000 uses PIR and magnetic sensors to detect intrusion. 2. When any moving objects are detected,SA-2000 immediately dials your mobile phone, pager or telephone. You can also hear actual sound from the scene. 3. A powerful siren, which is activated after the first notification, is enough to drive any intruder away. We have prepare an FAQ page to answer all your question please CLICK here for FAQ page and CLICK here to download the FAQ in PDF format. To purchase the above equipment please call or e-mail to SALES@SECURITEX.COM.SG or contact Securitex Electronic Systems Engineering. Our sales personnel will get back to you.